Say it with a star! This beautiful solid wood bird house, handcrafted by dedicated Amish woodworkers here in the United States, is the perfect way to invite nesting birds to make your garden their home. With a gorgeous finish and classic style, this piece promises years of enjoyment. Choose from a rainbow of colors to find your perfect shade! This piece is American through and through, from its unique design to the woodworkers who handcraft each bird house. 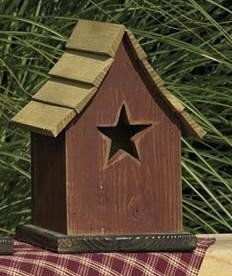 You can be proud to display our Amish Little Star Garden Bird House in your outdoor space for many years to come.